Cosplaying as Steven Universe is a piece of cake! You just need his signature t-shirt, a pair of your most comfortable jeans, and a little work poofing up your hair. Once you have that, you just have to master the art of having an optimistic attitude and you’ll be ready to head out into the world as the cheerful character from the cartoon. There’s just one problem. What if you’re not into wearing sandals? Steven Universe spends most of his time at Beach City, so sandals are a part of daily life. But, what if you’re trying to cosplay as Steven Universe at a place where sandals are not acceptable footwear? Or maybe you just don't like the way sandals feel on your feet? You still want to look like Steven from head to toe, right? 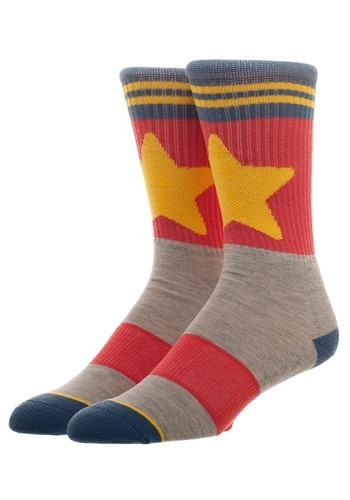 Then you just need these official Steven Universe socks! These socks come from the hit animated series and they do a great job of capturing Steven’s style in an accessory designed for your feet! They have the iconic star on the front, along with the red, blue, and gray color scheme associated with Steven. The socks are made out of a comfy polyester and spandex blend, so they’ll keep your feet warm in situations that are a little too chilly for sandals. Pair it up with the rest of your cosplay outfit for a look that will have you ready to take on the role of a Crystal Gem!